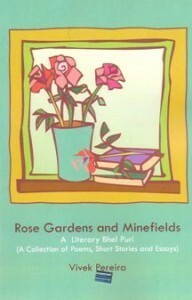 Vivek Pereira: Rose Gardens and Minefields – A Literary Bhelpuri. The author introduces his book to us with the lines, “The world we live in is full of beautiful rose gardens and dangerous minefields… In this book, rose gardens represent anything that is good, beautiful, pleasant, loveable and inspirational. Minefields, on the other hand, represent everything that is evil, ugly, destructive, demoralising and fearful. And so his book shares with you thoughts and lines on life, love, dreams, wars, plight of women, terrorism and other problems. His short stories are a pleasure to read – one has an undercover angel sent on a mission to Hell by God. The mission is to continue portraying Hell as the oft-pictured burning purgatory. But the angel finds it isn’t so, and decides to stick on there, without returning to Heaven. We can see an out of the ordinary take on corruption in the Heavensgate Scandal short story. In his work, the author believes that the fate of the Indian woman is in her hands itself, as she moves out from the kitchen to pursue independent careers. Other topics covered are secularism, Maoist rebellions across India, terrorism, communalism and sports in the country. Vivek’s words are lucid and one reading is enough to get the gist of what he’s saying. In fact, he deals with topics that are commonplace and well-understood. The cover is a clutter-free one with soothing colours and fonts – something I love.